A shift in consumer preference to more fashionable eyewear combined with improved living standards will increase demand for eyewear. Large disposable incomes will further encourage consumer spending on these items and this will drive growth in the eye wear industry. Research suggests that increasingly demanding work schedules have led to a dramatic rise in the incidence of chronic diseases among middle and low-class societies around the world. Chronic diseases such as diabetes can cause visual conditions like macular edema, cataracts and glaucoma. According to the world health organisation, cataracts account for over 50 percent of all the worlds’ cases of blindness. A swelling occurrence of chronic diseases related to eyesight in the society will cause growth in the eyewear market as patients seek products that will correct these arising visual defects. Technical developments in the development of eye wear and increased organisation will contribute significantly to industry growth. Adlensfocuss, an eyeglass manufacturing company recently launched eyeglasses that allowed users to alter their magnification. The glasses use proprietary technology to alter lens shape, thereby changing magnifying power. Innovations such as these are introduced by prominent companies like Bausch and Lomb Inc. or Johnson and Johnson Vision Care, to stay in the race to increase consumer demand and sustain growth. 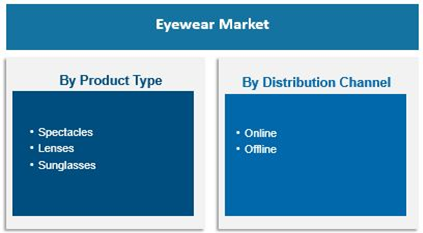 Leading players in the eye wear market include Luxottica Group S.p.A, Prada S.p.A, Safilo Group S.p.A, Cooper Companies, Inc., Fielmann AG, Essilor International S.A., Carl Zeiss AG, GrandVision, Hoya Corporation, De Rigo SpA. And so on. Cellulose acetate frames will be the most popular consumer choice and will, therefore, have the highest growth rate. Cellulose acetate is preferred by consumers because it is cheap and light. Though not very strong, frames made from this material are popular for being colorful. The metal frame segment is expected to grow at 3 percent for the next decade. Demand for this segment will be largely driven by the growing preference for durable and flexible eyewear. Contact lenses are a very popular choice in the eyewear market as projected in the report. Growing consumer preference for disposable lenses and expansion within the retail industry will encourage growth for this particular eyewear product. 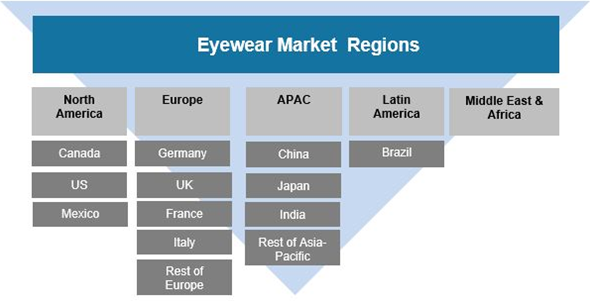 The global eyewear market growth was estimated at USD 120 billion in 2017 and is estimated to grow at 7.9% CAGR by 2026 as per the report published by Polaris Market Research. In 2017, the glasses segment conquered the global market, in terms of profits. North America was successful in dominating a larger share in the international eyewear market in 2017. It is expected that the Asia Pacific market will experience the highest CAGR from 2017 to 2026. Improved living standard in countries such as China and India, combined the growing penetration of luxury eyewear will enhance market growth in this region. Expansion of international companies into these countries to cater to market demands will also boost the market growth with the help of growing dependability on online shopping and home delivery option.